New excavations were undertaken at Horace's Villa from 1997 to 2001 under the auspices of the American Academy in Rome, UCLA, and the Archaeological Superintendency for Lazio. Director and principal investigator of the project was Bernard Frischer; co-principal investigator was Kathryn Gleason. Members of the Scientific Committee included: Anna Maria Reggiani, Maria Grazia Fiore, and Bernard Frischer. Field Directors were Gianni Ponti (1997-99) and Monica De Simone (2000-01). The excavation was made possible by generous financial support given by The Steinmetz Family of Los Angeles, The Vincenzo Romagnoli Group, and The Creative Kids Education Foundation. The Western Regional Office of Alitalia graciously offered free transportation between Los Angeles and Rome in 1997 and 1998. Nearly one hundred volunteers from twelve countries participated (for a list of names, please see Volunteers, 1997-2001). The countries represented included: Algeria, Austria, Canada, Germany, Great Britain, Israel, Italy, The Netherlands, Russia, Spain, Turkey, and the United States of America. In 1999, the volunteers were recruited by the University of California Research Expeditions Program. The UCLA Institute of Social Science Research and the American Academy in Rome provided administrative support throughout the project. Many specialists have helped with the analysis of our finds (click here for some pictures). They included: Dean Abernathy (architectural database); Claudia Angelelli (ceramics and marbles); Christer Bruun (waterpipes); Theodore Buttrey (coins); Stefano Camaiani (database creation and management; trench reports); Laura Cerri (trench reports); Monica Cola (new state plan); Luisa Del Guidice (folklore); Monica De Simone (building techniques, wall census, trench reports); Giorgio Filippi (analysis of roof tiles and stamps); Maria Grazia Fiore (the Licenza site in the medieval period); John Foss (soils and geology); Roberto Gabrieli, Francesca Colosi, and Dario Rose (accuracy of previous plans, new state plan); Steven Lattimore (sculpture); Elizabeth Macaulay (flower pots); Zacharia Mari (topography of the Anio and Licenza Valleys); Stephen Mols (wall painting); Archer Martin (metal objects); Luca Passalacqua (database creation and management, trench reports); Jennifer Ramsay (plant materials); Phil Stinson (architectural database); Maria Jose Strazulla (terracotta plaques); Murat Yashar (conservation); Sandro Veronese (geomagnetic and geoelectric prospection); and Klaus Werner (mosaics). In 1998 we were assisted by a team of archaeologists from the University of Sheffield, including Maureen Caroll, Colin Merrony, and Michael Charles. In 2000 a team from Genius Loci (London, England), including Peter Chowne and Bill McCann, provided valuable prospection services. Throughout the project, our Registrar was Linda Clougherty. Jane Crawford was Assistant Registrar. We express our heartfelt gratitude to our sponsors, collaborators, and volunteers for making the Horace's Villa Project possible. Bernard Frischer, Kathryn Gleason, Stefano Camaiani, Laura Cerri, Irene Lekstutis, and Luca Passalacqua, "A Preliminary Report on New Studies and Excavations at Horace's Villa: The Campaigns of 1997 and 1998," Memoirs of the American Academy in Rome 45 (2000) 247-276. 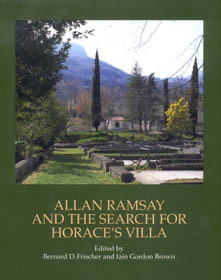 Bernard Frischer and Iain Gordon Brown (editors), Allan Ramsay and the Search for Horace's Villa with contributions by Bernard Frischer, Iain Gordon Brown, Patricia R. Andrew, John Dixon Hunt and Martin Goalen (Ashgate, London, 2001). ISBN 07546 0004 1. Published with the generous assistance of the Getty Grant Program. Click here for more information about this book.